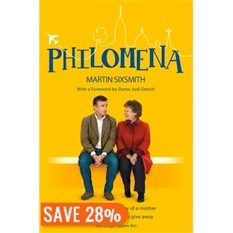 My book club read the book Philomena, by Martin Sixsmith and we met to discuss this week. The book is purported to be about a mother’s search for her adopted son. But the majority of the book is about her son trying to find himself and his birth mother. It should be called Anthony. We chatted about the themes in the book. The consensus was lukewarm. For me, the book is monumental, not for itself but that it’s the 100th book I’ve read this year. That seems like a mountain of books, but honestly, since beginning my reading mission in 2007, this has been the easiest year to meet my goals. (If your eyes glaze over when you see numbers, skip the next two paragraphs). In 2007 and for the next two years, I read a book a week. Partway through 2010, I realized I was reading two books per week so that became my new goal for 2010 to 2013. At the start of 2014, I had read 579 books since 2007. With a bit more effort I knew I could get to 700 in 2014. Then I decided, why not strive for 1000 books in ten years? That meant I had to read 421 books in three years, 140 books per year. The hundredth book puts me at 679 so far. 321 books with 28 months to go: 2.5 books per week. Let’s call it three. It may seem obsessive, but it’s quite exhilarating to be accumulating knowledge on a wide variety of topics, including health, business, politics, marketing, speaking, writing, spirituality, food, gardening, real estate, self-help, history, various other non-fiction, poetry, and even a few novels. People are shocked to learn of my reading habits. It has become such an integral part of me, I’m not as impressed as I once was. Here are my tips for those who desire to read more. Make reading a priority. We all waste time every day. If you truly love to read you will find some wasted time. And read! Carry a book. I always have one in my purse because I realized much of my wasted time is waiting…in line at banks and supermarkets, at appointments, even at restaurants and coffee shops when clients are late. (I sometimes purposely get there really early so I can read a few chapters!) I read about two “purse” books each month. I also have partly read books throughout my house: one where I sit in the living room, one on my nightstand, sometimes, one in the kitchen. I rarely read two novels simultaneously. The last time I tried, one book had a man who had lost a daughter and the other had a woman who had lost a son; I had a hard time staying on track: which book am I reading? Trade TV watching for reading. The average North American watches 35 hours of TV each week, a full-time job! Watch one less hour of TV each day and devote that time to reading. At one hour a day, everybody can read one or two books a month. Soon your books will call you away from most TV. Schedule reading times. My husband likes to sleep in on weekends. I usually can’t sleep past eight. So I read for two hours, keeping the house quiet for my sleepyhead husband. I often read a novel on a Sunday afternoon. On vacations, I plan to read a book each day. Airports are a great place to read books since so much waiting is required. And a four hour flight whizzes by when a mystery is unfolding in your hands. I can usually read a book before I get there and one to get home. I appreciate e-books when I travel. Before I go, I load up my iPad with books. I always bring a couple real books because airlines won’t let me use electronics on take-off and landing which can last many “chapters”. Sometimes I take books with me I don’t expect to want to keep so can I leave them behind in public places, surprises for strangers. Start with one book. Many despair that they could ever read three books a week! Start with one a month. Then two. You will become a faster reader. That’s what happened to me. I got faster so now I can read more. I can read 100 pages per hour unless the font is miniscule or the language archaic. I have no idea when this will stop. But I have a list of over 400 books to read, books recommended by somebody I respect, and there’s so much to explore at the library, I expect to keep reading. The number doesn’t really matter. It’s just fun to challenge myself and then reach those goals. Keep a record. One of the best things I’ve done is to keep a spreadsheet record of my reading. I record the dates I read the book, the title, author, source, who referred it to me, and whether I’d read again, recommend, want in my library or am happy I read it. I also include a description or any quotes that grabbed me. Very valuable. I often forget whether I’ve read a particular book. I simply search my spreadsheet. Also when people ask me to recommend books, I can remind myself of my favourites and choose books I think will be appropriate. Use your library! If I had bought every book new, I would have spent $20,000 so far! ($30 x 679 books). But I didn’t. I borrowed most books. Bought many used for $2 or less. Got some as gifts. And bought a few new, often at discount at Costco or as e-books. I estimate I’ve spent less than $700, including gift cards I’ve received, in nearly eight years, about $90/yr. Join or start a book club: Your reading list will expand when others add to it. There is nothing more fun than discussing a great book with others who’ve just feasted on it too. My club has led me to read books I never would have thought to read. Some are among my all-time favourites. One of the most important gifts you can give yourself is making time to read. Your knowledge will begin to expand immediately. Your vocabulary will grow: I’ve calculated I learn about 20 new words from every book I read. Reading strengthens your writing. I’m convinced I’ve improved. One of my few regrets in life was not having a degree. One day I discovered a quote to the effect that everything is written down in books. If one can read, one can be educated. That made sense to me and I haven’t looked back. Most people think I am educated in the traditional sense, often inquiring about my education history. I proudly tell them that my school is Life and my degree is self-directed and on-going. Then I tell them about the number of books I read and/or have read. It impresses. But it doesn’t matter to me. I do this for me, not to impress (unless someone is being elitist and snooty, then I might indulge in some chest beating). I’m enjoying my book journey. Won’t you join me?